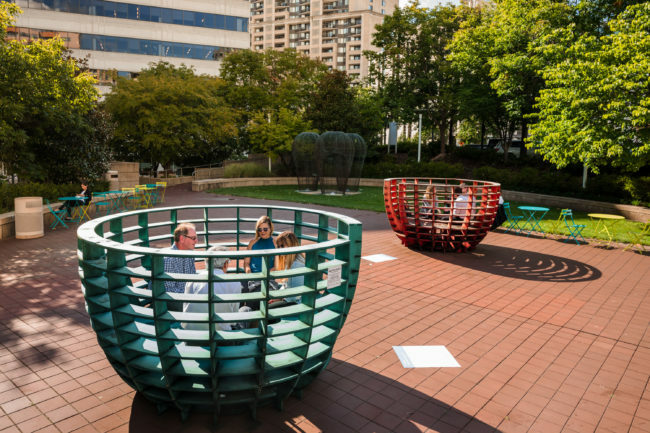 The Meeting Bowls by Spanish collaborative mmmm… are social places for gathering, getting to know people, and fostering dialogue in small groups. Each of these pieces of playful urban furniture is designed to accommodate eight people and encourage interaction by having those seated inside face one another. Three Meeting Bowls were fabricated and installed in Arlington from July through October 2017. After their stay in Arlington, the Meeting Bowls were moved to Miami, Florida, where they appeared in the Design District of Art Basel Miami. Arlington Arts’ presentation of the Meeting Bowls in Arlington and Miami Beach was made possible through a grant from Acción Cultural Española (AC/E), an agency that orchestrates public support for the promotion of culture, both in Spain and overseas. Co-sponsored by the Spanish Cultural Center (CCE Miami). The project was part of Courthouse 2.0: Reimagining the Civic, a public art initiative aimed at sparking public conversation about the future Courthouse Square by exploring the interaction between civic space and civic life in Arlington in the twenty-first century. View the September 23, 2017 artist talk with Eva Salmerón and Emilio Alarcón from mmmm… here. Check out an article on the project in the Washingtonian.